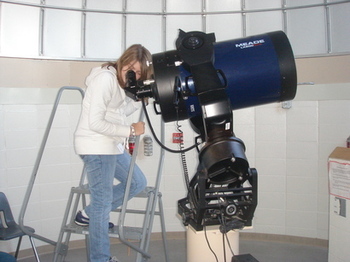 Join us at the JMS observatory to look the Moon, planets, stars, constellations, and anything else we can find in space. Public viewings will be held at least twice each month, if clear, along with special event nights when something of interest is happening in the sky above. Each night starts with a little introduction to the sky. We will fire up our projectors to give you a guided tour of the events for the month and even teach you to use a star map that you can take home, to continue your exploration. Next, we'll head outside for a tour of the constellations, pointing out the North Star and the seasonal highlights overhead. Finally, we will head up to the dome and our 14" telescope, for an up-close tour of the cosmos. Use your phone to capture your very own souvenir photo of the Moon. There is just so much to see! When visiting the observatory in public nights, DO NOT come through the school. Park in the north lot, south of 111th Ave N, on Yates Ave N.
PLEASE NOTE: Weather is always an issue! If it is cloudy or raining, viewings may be canceled. Check the website before coming. Dress for the weather. The temperature of the dome is like that of the outdoors. Please check this website at 6:00 p.m. on viewing dates to make sure viewing has not been canceled.